The AppleCare Protection Plan Extension for 15.4" MacBook Pro & 15.4" MacBook Pro with Retina Display from Apple gives you peace of mind by extending your coverage for an additional two (2) years of service coverage and extends the standard 90-day phone support to a 3-year plan. This provides you with expert assistance, global repair coverage for your 15.4" MacBook Pro & 15.4" MacBook Pro with Retina Display, web-based resources and diagnostic tools. AppleCare can be purchased at any time within your first year of Mac ownership. It must be registered with Apple prior to the expiration of the system's factory warranty. AppleCare can only be purchased by customers residing in Australia, Canada, France, Germany, Ireland, Italy, Japan, Mexico, Spain, Switzerland, the United States, and the United Kingdom. Terms and Conditions will vary based on country of residence. For more information, including international AppleCare contact information, please click here. This warranty extends the standard single year of protection for an additional two years. Repairs are performed by Apple-certified technicians using genuine Apple parts. For those who travel abroad, feel secure with a global repair plan for your 15.4" MacBook Pro & 15.4" MacBook Pro with Retina Display. The standard complimentary 90-day phone support is extended to a 3-year plan, giving you one number to call for all your technical questions. You'll have access to web-based support for your computer, allowing you to quickly diagnose and solve problems. Warranty The AppleCare Protection Plan covers your Mac, AirPort Card, AirPort Base Station, and Apple RAM purchased for your Mac. It also covers an Apple Cinema Display if it is purchased on the same receipt as your computer. 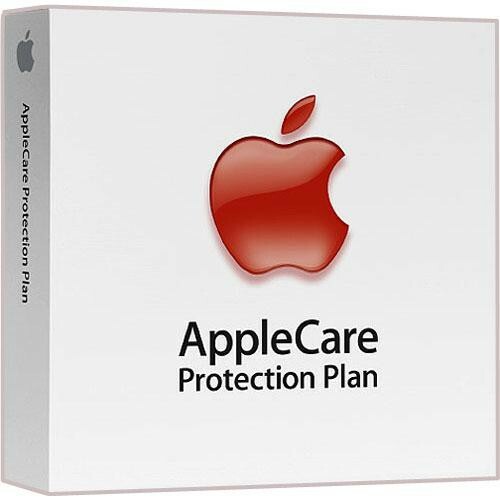 AppleCare Protection Plan Extension for 15.4" MacBook Pro & 15.4" MacBook Pro with Retina Display (2-Year Extension) is rated 4.8 out of 5 by 414. Rated 5 out of 5 by Larry P. from Great value when ordered from B & H Everyone has their own opinion regarding extended warranties. Mine is this one is totally worth the cost just to have access to the Apple support techs. Given this is an Apple product, I expect not to have any problems with the computer hardware, (one never knows though); but as new MAC users my wife and I have LOTS of questions regarding the applications. The techs could not be more friendly, nor more helpful and we have called them a bunch of times. And, they are all located right here in the US! I am also very pleased with B & H. Extensive product selection, great prices, and wonderful service. I couldn't be happier with the whole experience!! Rated 5 out of 5 by Jon C 1979 from Great Product...Even better price There isn't much to say other than an extraordinary product (AppleCare), for an extraordinary price. I've purchased AppleCare for every apple product I own and it has paid for itself many times over. I've had products replaced and serviced in a timely manner. The one thing is, I found it to be quite an investment... sometimes over 20% of the value of the product it is covering.. until now. BH offers the greatest price possible on applecare...see for yourself... shop around.. PS: Do not buy it on auction sites... often times it is a scam or you are dealing with people who aren't the most legitimate out there. Rated 5 out of 5 by Christee from A must have! I purchased AppleCare a year and a half ago for my new MacBook Pro. The computer ended up dying about a month ago and AppleCare gave me a brand new MacBook Pro that was actually an upgraded version from the one that I had. They even reimbursed me the year and a half I had left on the AppleCare, and I bought a new 3 years for the replacement computer.Outstanding service!!!!! Rated 5 out of 5 by Stephen from The best after-purchase care agreement I've been an Apple product user for almost three decades. I've had AppleCare for most of my products since it became an option and a few that didn't. With the coverage, anything that goes wrong during the second two years is taken care of if it is a part failure or defect. And, the cost of AppleCare is always less than the cost of any repairs/replacements that I would have to pay if I didn't have the coverage! It's like auto insurance, hoping you don't have an accident but knowing you've got the coverage, but no deductible required. Rated 4 out of 5 by revolving from I buy for peace of mind There is an on-going debate about whether AppleCare is worth it or not. In the past it was possible to buy it heavily discounted from online action sites making the decision a no brainer. In recent years however those deals are now few are far between (and the deals you do find may be scams). I found this AppleCare on this site which was the lowest that I could find on the Internet. Total time for the registration to be completed was less than 30 minutes (note this does vary case by case from what I've read). Highly recommend having this insurance for peace of mind. Usually if something happens to your Mac after the first year, it will be much more than the cost of AppleCare to fix. Rated 5 out of 5 by Norm - Author & Editor from AppleCare for 15 & 17 MacBook Pros B&H has one of the best prices available anywhere for a full, legitimate version of this AppleCare Warranty. Their online site makes it easy to locate and order any of the appleCare Warranties - and B&H carries them all. The warranty was delivered very quickly, and was the new, sealed version which was readily accepted by Apple. Combining a truly fantastic price, with fast delivery and the confidence that you are not only getting the best price, but also receiving the legitimate, true Apple product made ordering from B&H a true pleasure and it is something that I would and will do again. Rated 5 out of 5 by Sherman from Protection for Apple Laptop I use my Apple Laptop mainly for my photographs and am continually amazed when I am able to work on another photograph and have it turn out well. I love Apple and would not go back to a PC. I cannot think of anything I don't like about the Apple Laptop. I will of course use the Apple Protection Plan to get any Apple Technical help I need, either on the phone or at the store. It is a great piece of mind to have this protection plan. I have bought all my Apple Care Protection Plans for my Apple products from B&H and find that they have the best price and the delivery time is minimal. When you buy Applecare from B&amp;H, can you still bring it directly to an Apple Store for servicing, or must you go to B&amp;H? The AppleCare purchased through B&amp;H is still serviced through Apple. I bought this before my warranty expired, but it still hasn't shipped. Will I be able to use it? You would need to contact Apple with your invoice showing the purchase date. You will not be able to register online. Does this product actually physically ship? Will this be honored to cover a 2016 Macbook Pro with touch bar? Yes as long as it's the 15.4 version, this AppleCare Protection Plan Extension is for the 15.4 MacBook Pro &amp; 15.4 MacBook Pro with Retina Display. does it work for macbook pro that is registered to apple canada? That would be an Apple question, but adding the extension plan is the best value on the planet. Having an Apple tech available on the phone for any questions or help with a variety of issues is well worth the money. What's the different between this Apple Care that costs 299$ and the same Apple Care that sold in the Apple site at more 50$? is this the same?Apple hardware coverage:Your Mac computerBattery1Included accessories such as the power adapterApple memory (RAM)AirPort4Apple USB SuperDriveApple display purchased together with MacIs this Apple Care in B&amp;H not include battery coverage? The Applecare is the same, we price the package very aggressively. yes AppleCare will cover it as long as you get the coverage before the 1 year warranty expires. If I buy my macbook from Best Buy, then buy from this site. How will I be able to apply it to my macbook? You can buy AppleCare from anywhere and apply it to a MacBook purchased through any other retailer. When you receive your AppleCare kit, you just follow the instructions typing in your AppleCare registration ID that comes with the kit and your MacBook serial number into Apple's online registration form and you're done.